The wool was given to me by a friend, as she hated the colour. 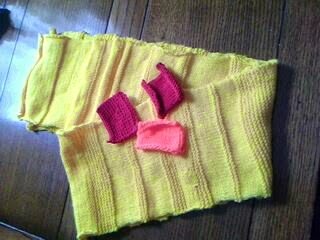 However, in my world, bright yellow is the perfect colour for a scarf, so I happily accepted it! I'm going to finish the scarf off by adding some colourful patches (as seen in the photo) and perhaps some colourful buttons to stitch on the bottoms bits! Also, this is the first thing I ever knitted in the whole world ever! So there are dropped stitches and various other weird and wonderful mistakes. Still I love it!